Warangal is prominent for the several remarkable lakes it has incorporated in its topography, it was also the former capital of Kakatiya dynasty. Laknavaram Cheruvu or Laknavaram Lake is a man-made wonder tucked away from civilisation in the Govindaraopet just 80 kilometres from Warangal, cradled by lush green dense forest cover and glorious hills. Laknavaram lake in the Bhupalpally district in the state of Telangana is locally famous by the name of Laknavaram Cheruvu. The lake amasses an area of over a whopping 10,000 acres. and was built by the Kakatiya clan when Warangal served as their capital. 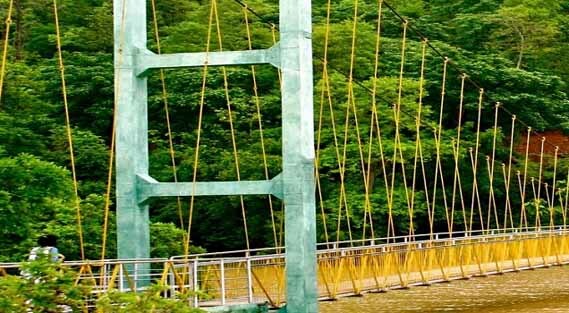 What is seemingly unique about Laknavaram is that it has 13 small islands spread across it within the lake and 160-meter-long three individual suspension bridges that connect 3 islands with each other and the main shore. The lake also has a medley activities for you to choose from for people of all walks of life and age groups and you could spend your day amidst gusts of breeze and revelling in the splendid views of the mountains and a sea of green as far your eyes can see. Around 50 km away from Warangal city is the beautiful Pakhal Lake which is spread over an area of 30 sq km. Amidst the lush green forests and hills, the human-made lake forms a highly picturesque location. This spectacular place will surely keep you stuck by its side. The aura here creates a perfect paradise for lovely couples. The lake also has a wildlife sanctuary located at its shore. The chirping of birds mingled with rejuvenating breeze and tranquillity makes it a favourite spot for picnics and nature enthusiasts. A man-made lake built during the Kakatiya Dynasty by the King Ganapati Deva in 1213 AD, it was made to serve the farmland activities. The creation of ancient times, even today, is seen performing its duty of providing water for irrigation. Approximately 3 Lakh acres of land is surviving over its waters. Located next to the Pakhal Wildlife Sanctuary, established in the year 1952 by the makers of this lake, the Pakhal Lake also provides natural heaven to the wild animals amongst the range of low hills and a plateau with safe ambience. This is the reason; one even spots a wide range of species of flora and fauna near the lake. The Thousand Pillar Temple is an ancient temple that is tucked away in a small town named Hanamakonda in the vibrant state of Telangana. As the name suggests, the temple has over one thousand pillars, some of which are a part or extension of adjacent pillars! These pillars are so tightly knit, they practically form the walls of the temple. Constructed in a star-shaped architecture, the Thousand Pillars Temple is a popular pilgrimage centre which welcomes more than 1000 devotees almost every day. The temple also contains a huge monolith Nandi, made up of black basalt stone. The three shrines located in the temple are together known as Trikootalayam. The mighty temple is a true specimen of Kakatiya architecture and Chalukyan architecture both, and this does a great job of enhancing its already overwhelming beauty. There are three presiding deities in this temple- Lord Shiva, Lord Vishnu and Lord Surya. According to the Hindu traditions, Lord Vishnu is the preserver of the universe- the one who ensures that elements of vitality are preserved to strike the balance, Lord Shiva is the destroyer of the universe- the one who destroys negative elements of the universe and give way to the birth of a new beginning, and Lord Surya- the sun god, the one who sustains the whole universe by his warmth; without whom the whole universe would be just an enormous pit of darkness. And to think that this temple houses the shrines of all the three mighty lords under one roof, a compelling reason to witness this powerhouse of positive vibes and uplifting energy. The temple was built by Rudra Deva and hence houses a deity in his name too. The magnificent structure of Ramappa Temple is situated about 77 kilometres away from the main city of Warangal, right in the heart of the ancient capital of the Kakatiya Dynasty. Dedicate to Lord Shiva, the temple is believed to have been constructed over a period of 40 years. It was built by General Recherla Rudra during the period of the Kakatiya ruler Ganapati Deva. The edifice of Ramappa Temple is an exquisite example of Kakatiya style of design and is covered in detailed carvings that depict the life in the olden times. The intricate architecture and mighty foundation has stood the test of time and is a wonderful look into the culture and history of Hyderabad. Also known as the Ramalingeswara temple, it derives its name from the sculptor Ramappa who built the statue of Shiva and pioneered the worship of the deity here. As you enter the premises, you are welcomed by two delicate statues of dancers striking graceful poses. A massive 9 feet Shivalinga is enshrined in the temple and is the main deity here as well. Two other smaller Shiva shrines can also be found on either side of the main temple, although both are in ruins. The Nandi inside the temple appears to be alert, ready to follow the order of the lord and has survived the test of time. This one of a kind, enchanting Musical garden in Warangal is located nearby the famous Bhadrakali temple. A massive garden, it overs a total of 15 acres. A visually pleasing musical fountain with eye catching colorful lights is the main attraction in this garden. A mammoth rock and an artificial waterfall in the rock structure are placed as the background of Kakatiya Musical Garden. The authorities have also made a man made lake for facilitating leisure activities such as boating. The musical fountains start from 7pm everyday. Goddess Bhadrakali is one of the ten great manifestations of the Supreme Goddess of Hindu cosmic mythology and the Bhadrakali temple at Warangal is devoted to the god of rage and fury and protector of the goodness from the darkness. The temple is in a real sense an ancient one – dating back to 625 AD to the era of the Chalukyan kings or so is depicted from the in-house inscriptions. Not just history and mysticism, the magnificent temple is an attraction because of its picturesque beauty of natural rock formation and the vast lake that creates an undeniable spiritual serenity about the place. Tourists can simply enjoy the soft breeze and take in the vast expanse of it, or choose to go boating as well. Tourists love to have a glimpse of the Bhadrakali temple mainly because unlike most of the other temples of the Goddess and her various manifestations in South India, the deity of this temple does not have the calm and soothing ambience about it. The temple enshrines the Goddess Kali, the mother Goddess in Hindu mythology, adorned with weapons in all the eight arms and the statue of the Goddess is in the sitting posture with a crown in her head. The structure of the temple is in the amazing architectural style of Chalukyas. With its roots too deep into Indian history as well mythology, the Bhadrakali temple attracts thousands of devout visitors every year - those who want to have darshan of the Shakti manifestation as well as those who just want to explore a great architecturally and historically significant site. The Eturnagaram Wildlife Sanctuary is one of the oldest wildlife sanctuaries in the Telangana region located about 110 kilometres from Warangal. It was declared as a wildlife sanctuary due to its rich biodiversity by the former Hyderabad Government in 1953. The sanctuary has unique features spread across its length and breadth which one cannot stop praising.The Dayyum Vagu River flows through the sanctuary making it appear even more beautiful and separating it into two parts. Natural vegetation covers the sanctuary and enhances the scenic beauty of the place to a different level altogether. People from all over visit this exquisite location to unwind and spend a fun day away from the fast-moving and hectic life. There are steeps and some gentle slopes in the wildlife park along with a historical significance dating back to the existence of the tree fossils in this Sarvai area and caves. This natural park is spread over an area of 806 square kilometres and is believed to be one of the rarest eco-regions around the world. Three-fourth of the sanctuary is covered in rising and falling plains and dense forest formation while the remaining one-fourth comprises of springs and streams. Eturnagaram Wildlife Sanctuary is also very famous for the largest tribal jahtra of Asia known as Sammakkka Sarakka Jathra which takes place once in every two years. The wildlife refuge is dense with ephemeral teak woods, and many exotic and rare wild animals such as the tiger, spotted deer, wolf, panther, black buck, Chinkara, giant squirrels, jackals, nilgai, sloth bear and four-horned antelopes. To see wildlife in its natural habitat with lush and sparkling greenery all around, a visit to this forest wildlife sanctuary is a must. Lakhnavaram Lake is famous for holding 13 islands which are covered with dense forests, in its midst. Covering an area of around 10,000 acres, this lake basically stores rain water. In recent times, the local department of tourism has established a hanging bridge, which connects three of the islands. As decided by the government, various development works have been planned to make this lake a more prominent tourist destination.